Each January, the Swiss mountain gathering provides a snapshot of elite thinking. Often it proves to be wide of the mark. This year the global economy, Italy’s election, the importance of crypto-currencies and Saudi reform produced what may be the surest examples of groupthink. 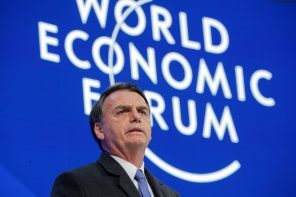 For the finale of the World Economic Forum, the U.S. president laid out in unexpectedly statesmanlike fashion how favouring the interests of his citizens could benefit the rest of the world. The demand for reciprocity remains, but the inclusive-sounding vision is an improvement. The U.S. president seems to be trying to right past trade wrongs. But business has long since moved on, meaning tariffs on washing machines and solar panels will do more harm than good. Also, Merkel and Modi disappoint in snow-ravaged Davos. Plus: Spotify’s Wall Street snub. Leaders including Emmanuel Macron of France and Germany’s Angela Merkel predictably spoke up for global cooperation ahead of Donald Trump’s finale. Unlike the Chinese president last year, however, their rhetoric fell flat. Competition for investment further muddles the message. Wannabe fintech disruptors are out in force at Davos. Regulation and poor returns helped protect big lenders up to now. Renewed interest in financial services from the likes of Amazon and Apple poses a bigger threat. Banks will need to either join forces or partner with Big Tech. The U.S. Treasury secretary said a weaker dollar was good for his country in some ways. True, but the break with what his predecessors have asserted since 1995 raises the risk the greenback will be used as a trade weapon. That would be bad news for foreign holders of U.S. debt. This year’s summit in the Swiss ski resort is chaired entirely by women, with gender a big theme at panels and parties. But the summit's low female attendance reflects the global imbalance of power. Tighter quotas would make Davos more politically correct but less formidable. To ensure intrigue when world leaders and CEOs are locked in the Swiss mountain resort, the World Economic Forum mastermind is employing reality TV tricks that made Donald Trump a star. This year's gathering may rival the business show for ratings-boosting drama. But it's risky. The U.S. president heads to the Swiss Alps confab that’s the antithesis of his “America First” ideology. He’ll have competition: keynote speaker Narendra Modi, with his “Make in India” policy. Plus: BlackRock’s Larry Fink pushes social activism. And why Ford is stalling. The U.S. president’s “America First” agenda is the antithesis of the Swiss conflab’s global ethos. His visit to the mountain resort may be a bid for reconciliation, or a pitch for strongman status. Either way, his presence is a stark rebuke to Davos elites who got him badly wrong.